A fan in Japan was never just an accessory: a poem, a secret letter, a phrase book, a dancer’s attribute or more often a weapon (offensive or defensive fans existed), it was always the essential part of the outlook. Counting its history from 2nd century BC China and made from wood, bamboo, paper, silk and metal, fans were folding (sensu) or just rigid circular (uchiwa). Check the wikipedia Hand Fan article for more history & pictures. Associating ikebana with a fan, finding inspiration in it, seemed to me something natural to add to the student’s program. Yet for some reason, we never tried that before in my own practicing class. But I’m sure Japanese teachers do it! So I can’t say that was the topic I invented, I was just happy to use my imagination & implement it into the program. 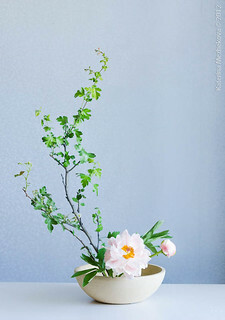 And as this is one of those topics that you can practice at any level of ikebana, my students were doing it in the course of their kakei-ho studies of basic variations. Let’s say these three compositions below represent 3 different summer months, though mine orange one is more about September for me… The others being July and June respectively. In my arrangement I use an original japanese fan, a family treasure, which is a classic example of decorating the fans with 2 seasons pictures (the opposite side has a blooming sakura on it). The idea to put daylily and willow together in a metal indian vase was to emphasize the beauty of mystery & the possible danger that through the ages was associated with the fans, war fans, especially used by ninja’women (kunoichi). Yet having some fresh air between the leaves and the tranquility we get from the willow. And it’s still Reversed Variation 2, slanting style, nageire. If we imagine this arrangement below is about July where we tend to hide in the shade of trees and overgrowing greenery of gardens to find a safe place from the cruelty of sun burning all down, we can feel the light breeze in it! 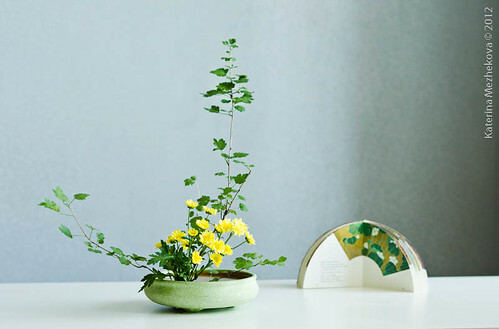 The tender coolness of yellow chrysanthemum, and the light green ceramic bowl remind us we can find a shelter near the water and relax with a proper the midsummer pace. The fan used here is a printed copy of the one dating back to late Tokugawa period (1792-1867), used by Noh theater actors in a play named Faded Beauty. 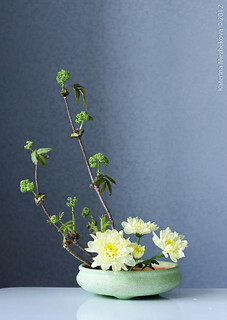 And it’s Variation 1, upright style, moribana. Here we can think about June, the full beauty of the fresh leaves and the flowers in their glory days. Open the window facing the garden and you will feel that instantly. The exuberance of nature! 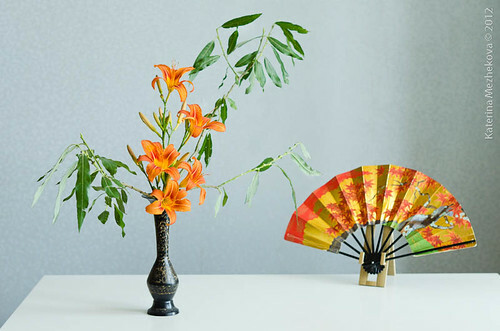 But not without its lightness, little birds and butterflies here and there, rays of sunshine dancing…The fan also dates back to late Tokugawa period, was used in a woman play of Noh theater, called Lady Tamakatsura. And this is Variation 2, slanting style, nageire. The fans used in arrangements 2 & 3 are taken from a book Painted Fans of Japan: 15 Noh Drama Masterpieces by Reiko Chiba. And I´m more than sure that we will continue doing fan’inspired arrangements during my ikebana classes. 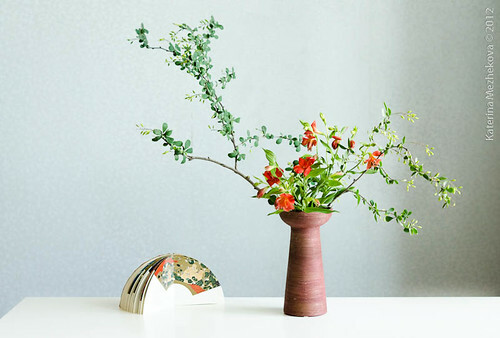 The programme is based on Sogetsu Textbooks, with Kakei-ho covering Books 1 & 2, giving the schemes to make the basic arrangement & and their variations in 2 shapes – upright & slanting, and in 2 styles – moribana & nageire, using 2 different types of vases. Basically every week we come to the class & practice ikebana, listening to aerial inspirational music while we arrange (to get in the ood & not to talk that much). We are also watching some inspirational pictures & talking about floristic techniques & philosophical matters of the arrangement. I’m very proud of my students’ works & their progress, and I’m happy that step by step they are joining me on the way of expressing ourselves through flowers…Thanks to Lily, Jane, Nastya & Masha for their work & check out the next post – “How is it going in the class, part2 – learning nageire” – to have more of their works! And why do we practice? 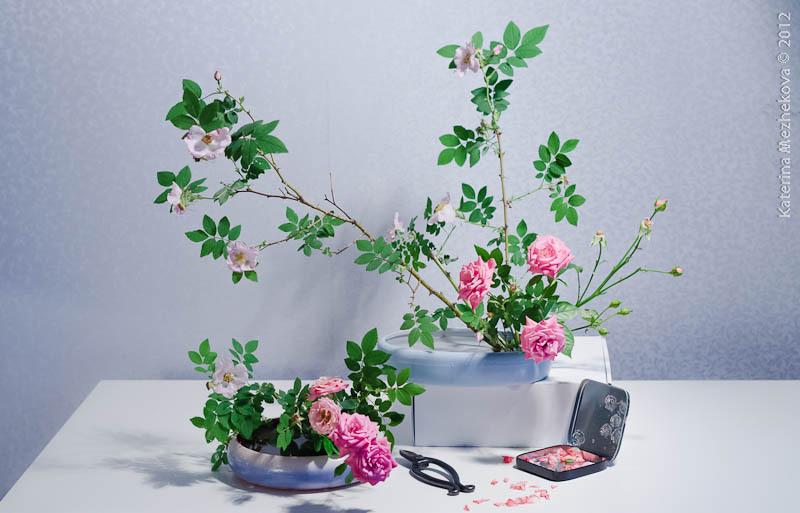 Imagine that ikebana is a verse, a sentence, a saying consisting of words…So we practice not just to enjoy it, but also to shape all the words, to spell them clearly. Have a look how two different vases changed the overall impression of the white tulip or white apple blossom arrangements from the slideshow? The transparent glass adds more fragility to the spring feeling of the composition, it´s a stronger adjective in our sentence. And here above with the Easter & the coming of Spring theme, you can see how the basic arrangement can be very exciting to make. Because you don’t just follow the scheme, you follow your heart! Well, below we are adding some meaning to the Basic again. This time, the theme was to make an arrangement inspired by the verse. In the slideshow above you see a composition inspired by Lewis Carol’s “Alice in Wonderland”. Actually, this type of tasks you can add to any kind of arrangement at any level of studying ikebana. And then we are trying to get the arrangement more complicated by setting kind a still life scene around it, adding some more context to the idea. We also practiced arrangements inspired by Eastern verse & the Japanese fans.